So just for the uninitiated, this recipe does appear in the Merry Christmix cookbooks, (not telling which one, you need to get them both to get your Christmixing on track!) Don’t be shy...and we’re going to include the video version of the online Christmix class I did recently...it will be emailed to all who buy the bundle...go sort it out, then your Christmas will also be sorted. We promise. Happy Mixing! Place juices, sugar, vinegar, salt and pepper into Thermomix bowl and reduce 10 min/Varoma/ speed 2/MC off. Meanwhile, chargrill the chili on an open flame until blistered and black. Cool slightly before rubbing skin off. Deseed if desired. Add to Thermomix bowl with eschalot. Blend 10 sec/speed 10. Taste and adjust seasoning. Add EVOO and stir to combine 5 sec/speed 5. 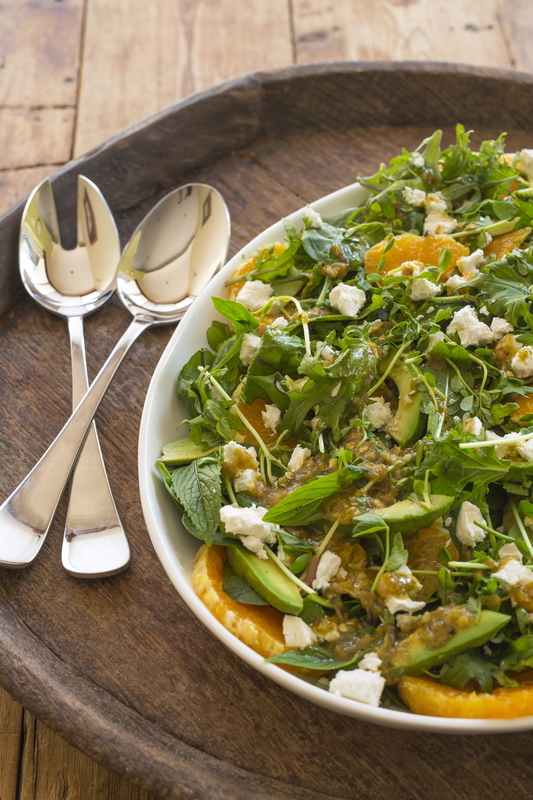 Combine salad ingredients except feta onto a large salad platter. Drizzle with dressing and finish off with the feta.